When I began this site in 2006 I was interested in documenting some aspects of the San Francisco Bay Area. I had looked at a few printed guidebooks and online sites and found several of the comments and recommendations about the region ludicrous. My main site was www.rightreading.com, and I decided to make it a little more tightly focused on book publishing. 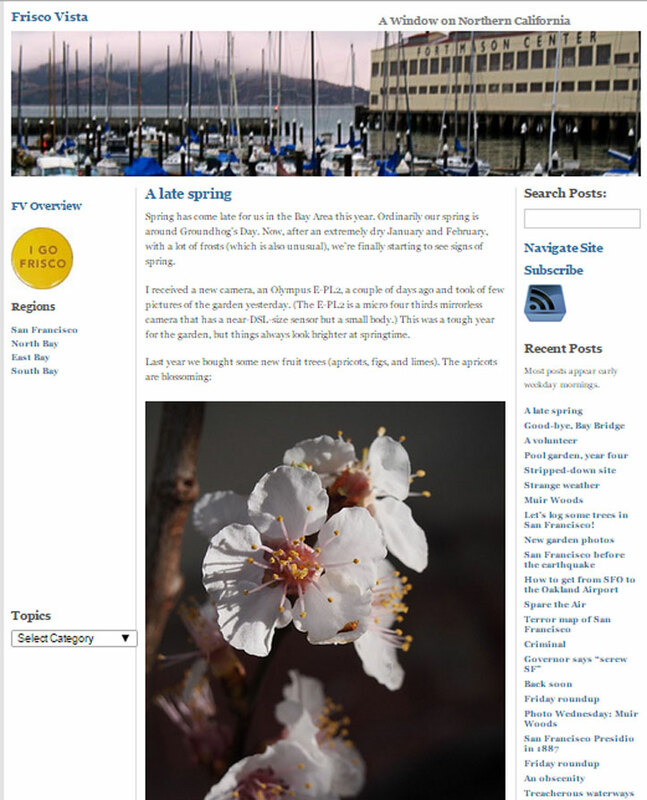 Working in the city and living in the East Bay, it seemed reasonable to spin off regional content into a new site. To shake up stodgy locals I called it Frisco Vista (there is a lot of groupthink in the Bay Area, and most residents would rather be caught worshipping at an altar to Satan than uttering the word Frisco). For the past several years I have been too absorbed in print projects to give much time to webwork. Besides that, I’m no longer motivated to maintain a broad regional site (as is obvious from a glance at the post dates — an attentive reader might also notice an increasing emphasis on garden themes). I no longer work in the city, and I now spend a lot of time maintaining my garden. As I also have an interest in photography, I’m fairly often inspired to photograph some of the garden, and I thought of starting a tumblr devoted to that. Instead, I’ve decided to rework Frisco Vista into Tom’s Garden (unless I can think of a better name). At least for now, I’ll retain the FV domain, but I’ve already begun to change the appearance and structure of the site radically. Since the site has been in deep hibernation, I’m not going to take it down and work offline but instead will make the changes bit by bit as live updates. (I’m also back adding some posts replicating content from my Facebook account.) Maybe someone will be interested enough to stay tuned and see how things evolve . . .